I love plants; my Mother turned me into a gardener, as a child, telling me, as I have already shared on these pages, that playing in the dirt was good for my nerves. I would be lying if I said that I do not buy plants, but if you are a novice gardener, may I recommend you find others who like to play in the dirt – gardeners love to share – join a garden club! With gardening, I prefer the found, shared, gifted, or grown from seeds or cuttings plants; though walking around a nursery that sells some exotic or hard to find offerings, like orchids, is a true delight and a pleasure I enjoy indulging in, even if I am only window shopping. 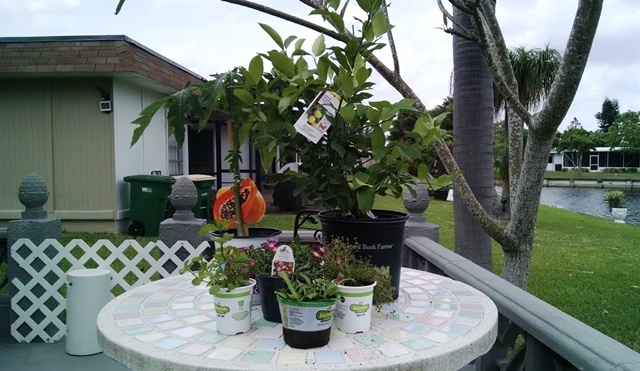 Recently, feeling that our time in Florida is coming to an end, I decided to throw caution to the wind, and go buy a Meyer’s lemon tree, that I have wanted for years. While Kate was doing something at Home Depot, I went into the garden section, and decided to shop, until my heart was content. The photograph above was what I bought. When I got home, I placed all of the plants on the backyard patio, and sat down to admire my purchases with some iced coffee. As I looked at what I had purchased, I was suddenly quite taken with my eclectic acquisitions, and thought a bit about why I had bought those particular plants. My garden, like everything else in my life, is an amalgamation of the life I have lived; the people and the places that have impacted who I am. As always, my Mother was right; gardening is good for the nerves. In Maine the season is almost done, there are a few perennials, but the annuals are already marked for clearance, soon we will be inundated with the ubiquitous mums; but with the exception of some pumpkin seeds that I planted outdoors, most of my garden is indoors, around the pool. I love going into that room, and as I stroll around the plants, I of course think about my Mother, with her grapefruit tree, over six feet tall now, that she planted from seeds, I do think of my Aunt Helen, and her bleeding heart, that she brought to me as a cutting in a vase, from a plant in her yard, telling me that they would grow if I planted them; I remember the garden club, in Florida, when I first moved into our home, and all of the many plants I see growing in Maine, that came from those days of sharing, the bromeliads that Evelyn and I would exchange, and the Plumeria’s that I learned to love in Hawaii, but acquired when Joan ordered two inch pieces for us, the fig tree that I grow because it reminds me of Pico Rivera and of Greece, and Lia’s grandfather’s orchard, that I so fell in love with, the tomatoes and cucumbers that my great niece so enjoys picking, the grape plants that remind me of Delano, the beautiful philodendron Hannah gave me for Christmas five years ago, my first orchid that came from Ibis, and the orchid given to me by Marcial and Adriana, and now my Meyer lemon tree, that I had never heard of until Irving, one of the most fascinating people I have ever known, introduced me to them . . . and oh so much more. Gardening is a wonderful way to keep and make memories; as well as eating fresh and delicious produce, and providing yourself with lovely blooms. This entry was posted on July 28, 2018 at 12:01 am and is filed under Nature, SlideShow, Uncategorized. You can follow any responses to this entry through the RSS 2.0 feed.